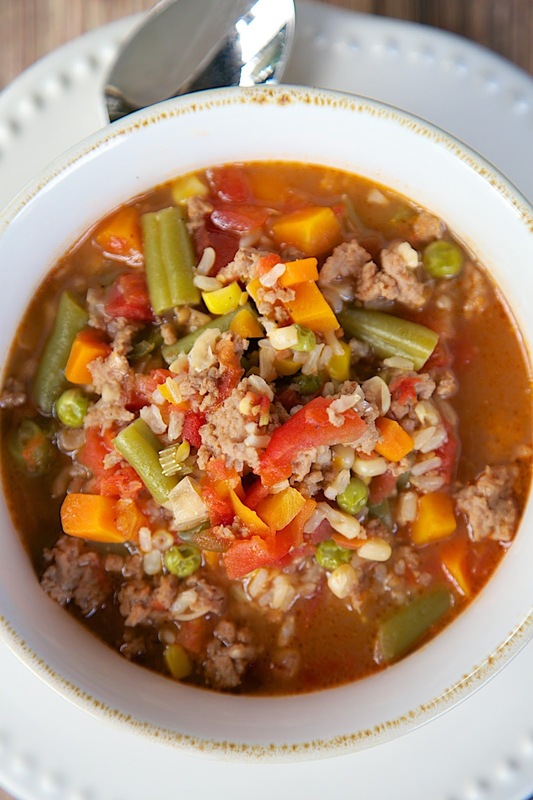 Turkey Vegetable Soup - ground turkey, mixed vegetables, beef broth and brown rice - ready in under 30 minutes. Leftovers are great for lunch and it freezes well. My husband gobbled this up! I've already made it 3 times this month!! I've made this Turkey Vegetable Soup a couple of times this month. It is SO good and actually pretty good for you too. BOOM! This soup has tons of great things in it! Ground turkey, tomatoes, mixed veggies, corn and rice. It has lots of great flavor. We like to eat it for dinner and again for lunch the following day. I freeze any leftovers for a quick lunch or dinner later in the week/month. I made a few little swaps to the recipe. Ground Turkey instead of ground beef, lower sodium beef broth and brown rice instead of white rice. I actually preferred the swaps. I can't imagine that it would taste any better with the "regular" ingredients. This is totally going in our regular lunch/dinner rotation! In a Dutch oven or large sauce pan, cook ground turkey until no longer pink. Drain any fat. Add frozen vegetables, beef broth, creamed corn, diced tomatoes and green chilies, stewed tomatoes, onion powder, garlic powder, salt and pepper. Bring to a boil. Reduce heat, cover and simmer for 15 minutes. Add instant brown rice. Cover and continue cooking for 10 minutes. This looks great & so easy to make. Definitely making today!! Yum! Just what the doctor ordered this week! 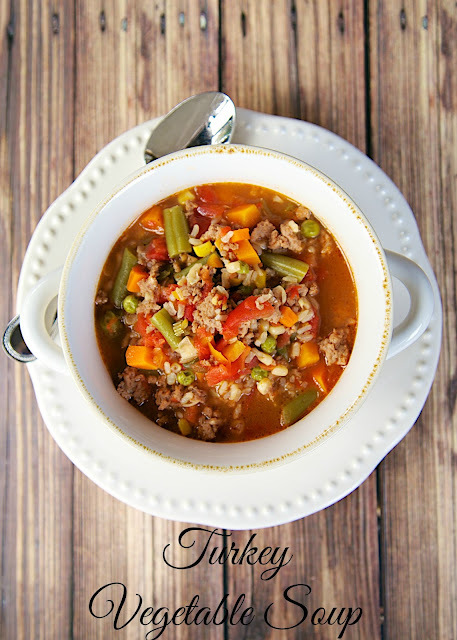 I can't wait to make the turkey vegetable soup! Oh good, I have everything to make this. Supper is planned. - DawnJoy M.
This looks delicious and, best of all, easy! Thanks! Can't wait to make this soup! The Kroger giveaway would be great too! 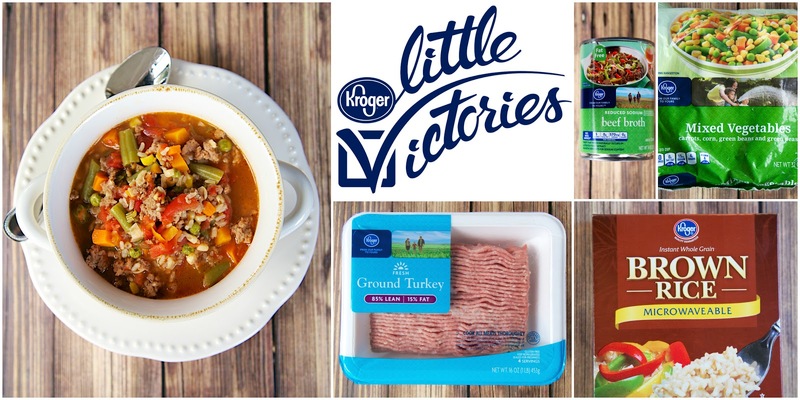 This looks really good, and Kroger is my go-to grocery store! I was at the gym for the 6th day in a row this morning! I use so many of your recipes! Love your website and I can't wait to try this one too! This looks so good and simple to put together. Thanks so much. I chose to have no meat in my omelet this morning! Lots of veggies! This looks yummy! We LOVE soup this time of year! Looks delicious! Love so many recipes posted on Plain Chicken! I'm not a big fan of brown rice but I bet you can't even tell once you put all the other stuff in. Yummy! This looks so good!!! It's so good! I made it with ground venison and white rice. It was great. It was so good! I made it with ground venison and white rice. It was great! I just made this with cauliflower rice and BOY was it yummy!